Robin discovered the healing power of Physical Therapy at the young age of fourteen after undergoing three hip surgeries and a knee surgery. The physical therapists that motivated and encouraged her throughout her rehabilitation journey were an instrumental part of her calling. She attended Seattle Pacific University for her Bachelor’s degree in Applied Human Biology (2014) and received her Doctorate of Physical Therapy (2018) from the University of New England. After enduring the harsh New England winters, Robin was drawn back to the beautiful Pacific Northwest. Her goal is to promote well-being in her patients’ lives through facilitating the body’s amazing ability to restore movement and function. 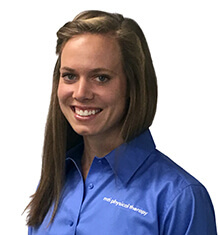 Her desire for a deeper understanding of the body’s complexities and her commitment to developing stronger evaluation and treatment skills has led her to pursue the Orthopedic Manual Therapy Residency Program through the Ola Grimsby Institute. While not in the clinic, Robin enjoys hiking, traveling, swimming, playing piano, soccer, and creating community wherever she is living.